Psoriasis Vs. Eczema – What Are The Differences? Do you know what’s the difference between Psoriasis and Eczema. 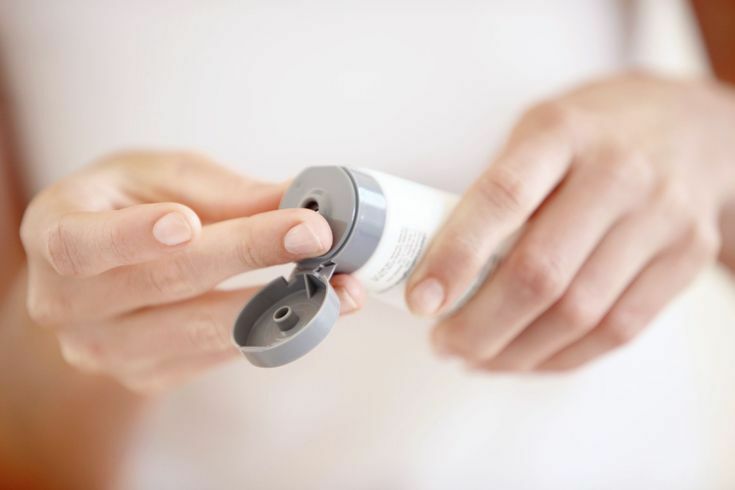 Both psoriasis and eczema are severe skin issues that affect millions of people. Psoriasis is a genetic autoimmune condition that results when skin cells grow too quickly and produce thick and uncomfortable raised patches of skin. 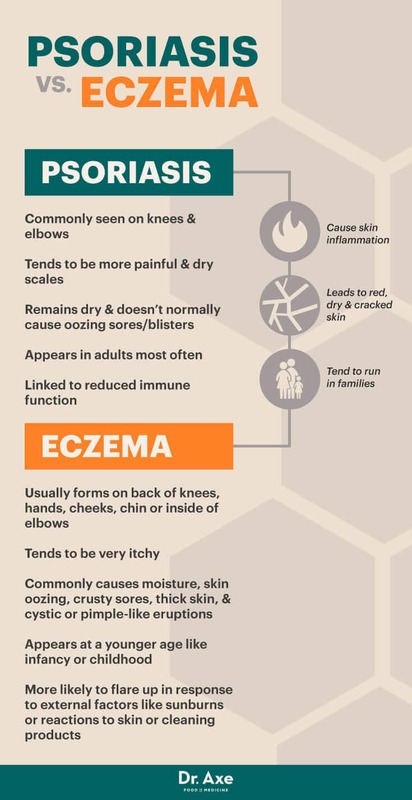 Eczema is a general word that is used to describe itchy skin conditions that are generally caused by dry skin, illnesses, irritants, allergens or stress. Eczema is most commonly an inflammatory response that occurs when an irritant comes into direct contact with sensitive skin. Here are some key differences between Psoriasis and Eczema. Psoriasis can start at any time but usually occurs between the ages of 15 and 30 years of age. It is not uncommon for psoriasis to start later in life between 50 and 60 years old. Eczema occurs most often in babies and young children. The symptoms will generally lessen as the child gets older. There are some cases when skin conditions will occur in adults. Psoriasis will present with thick, red or white patches. These patches can sometimes appear silvery and scaly. The patches can present anywhere on the skin, but they are most apt to show up on the elbows, outside of the knees, the scalp and the lower back. Pitting in the nails can also occur. This will make them brittle and potentially cause them to crumble or fall off. Eczema will present as red, dry and cracked skin. Severe cases will show the skin blistering and weeping. The blisters may appear fluid filled. There are certain forms of eczema that will cause your skin to look discolored. You will likely see eczema present on the face, scalp, chest, back, neck, wrist and ankles. Psoriasis triggers include stress, illnesses, dry or cold air and medications that have lithium or beta blockers. In some people, sunburn or a scratch can also trigger a flare up of psoriasis. It is unproven, but many people also believe that alcohol, sugar, red meat and diary can cause flare ups as well. Eczema triggers will vary depending on the type of eczema that you have. 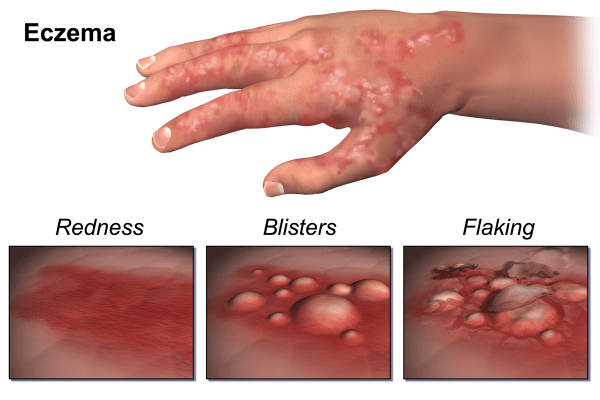 The most common causes of eczema flare ups include soaps, laundry detergents, foods, environmental allergens and viruses. Itchy materials such as wool can also cause a flare up. In some people, a sudden change in temperature or stress can cause an eczema reaction. Psoriasis treatment will include topical creams and oral medications to slow down or even stop the over-accelerated skin cell production. Many of these medications will include light therapy, topical corticosteroids, retinoids, salicylic acid and biologics. Home remedies include oatmeal baths to relieve itching and the use of a humidifier to prevent dryness in the air. Eczema treatment will include the use of topical creams and lotions that will be used to help manage the dryness and irritation. Cold compresses have also been used to relieve very painful itching. An antihistamine or corticosteroid may be prescribed by your doctor. Below is a comparison table showing Psoriasis Vs Eczema in a nutshell. A genetic autoimmune condition that results when skin cells grow too quickly and produce thick and uncomfortable raised patches of skin. A general word that is used to describe itchy skin conditions that are generally caused by dry skin, illnesses, irritants, allergens or stress. Between the ages of 15 and 30 years of age. Occurs most often in babies and young children. Thick, red or white patches. Red, dry and cracked skin. Show up on the elbows, outside of the knees, the scalp and the lower back. Show up on the face, scalp, chest, back, neck, wrist and ankles. Triggers include stress, illnesses, dry or cold air and medications that have lithium or beta blockers. Triggers will vary depending on the type of eczema that you have. Treatment will include topical creams and oral medications to slow down or even stop the over-accelerated skin cell production. Treatment will include the use of topical creams and lotions that will be used to help manage the dryness and irritation. 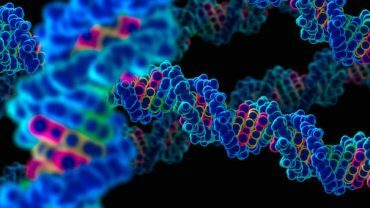 Gene Vs. Allele: What Are The Differences? Heterozygous Vs. Homozygous – What Are The Differences? Adderall Vs. Ritalin : What Are The Main Differences?